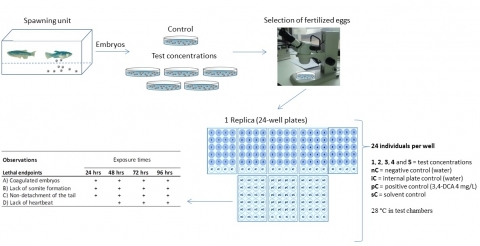 Zebrafish is an ideal model for toxicity screening of different compounds. The results obtained from this animal can be extrapolated to humans and other vertebrates. Our group carries out assays of toxicity of different types of compounds in Zebrafish embryos and larvae. Currently, we are specialized in nanoparticles from various sectors: pharmaceutical, textile, environmental, industrial chemical product, etc. Some assays are based on official protocols of the OECD. Fish embryo acute toxicity test (FET) is the most commonly used (Fig. 1). This test involves incubation of embryos in a concentration range of the chosen compound (during 96 hrs post-fertilization). Apical observations are recorded as indicators of lethality: coagulation of embryos, lack of somite formation, non-detachment of the tail, and lack of heartbeat. The data acquired are analyzed by software tools to obtain the LC50 values. Additionally our group has a powerful confocal microscope that we do uptake and biodistribution studies in real-time. Zebrafish also is a highly versatile system for toxicogenomic studies. For this reason it represents a great tool to study genetic changes (by overexpression of genes) when it is subjected to the presence of a compound. To carry out these studies we use techniques such as RNA sequencing (RNA-seq), DNA microarrays, etc. Importantly, our group takes into consideration the ethical perspective of “3R”: replacement, reduction and refinement for animals used for experimentation.